Things have gone from great to middle-of-the-pack for Dallas Cowboys quarterback Dak Prescott since his triumphant entrance to the NFL stage. Back in his rookie year, a year in which the Dallas Cowboys secured the top seed in the NFC and home-field advantage throughout the playoffs for the first time since 2007, Prescott helped his team to a 13-3 record – tied for the best record in team history – on his way to an overall grade of 83.7, the eighth-best grade among quarterbacks that year, and at the time (before Baker Mayfield came along), the third-best grade ever earned by a rookie quarterback. That year, Prescott ranked ninth among the league’s quarterbacks with at least 100 dropbacks in passing grade (79.7), fourth in yards per attempt (8.0) and 11th in adjusted completion percentage (75.4%), while his passer rating of 118.0 on throws from a clean pocket was good for third among quarterbacks, trailing only the eventual Super Bowl contenders in Matt Ryan (128.9) and Tom Brady (123.0). Secondary to all that was Prescott’s impressively efficient play when he was pressured, which is a facet of play that usually trips up first-year players at the position. 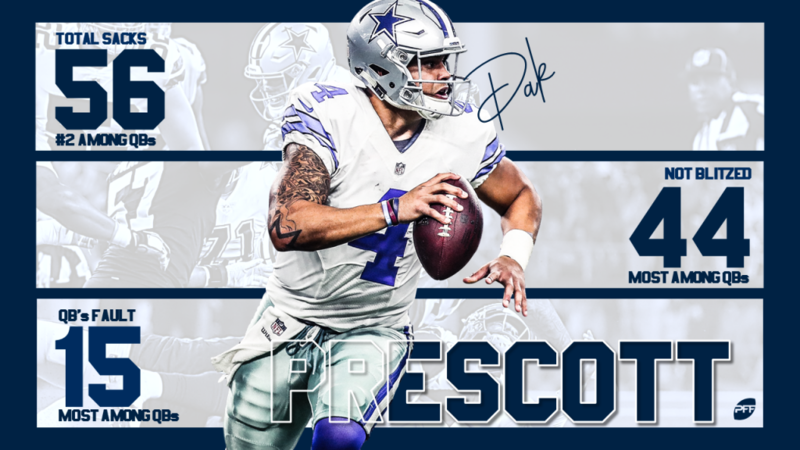 When he was moved off his spot during his rookie year, Prescott completed 75-of-142 attempts for 791 yards, four touchdowns, and just one interception. His passer rating of 75.8 on those throws ranked 10th among the 37 quarterbacks with at least 50 pressured dropbacks, and his adjusted completion percentage of 69.5% on those throws ranked sixth. It was far from perfect, as he logged nearly as many turnover-worthy passes (4) as big-time throws (5), but his play under pressure was made all the more impressive by the fact that he was sacked on only 14.1% of his pressured dropbacks, which was tied for the tenth-best rate among signal-callers. Unfortunately for Prescott and the Dallas Cowboys, that special ability to evade sacks has all but disappeared in his third NFL season, which could be a real problem for the team as they get ready to face the Los Angeles Rams in the divisional round of the playoffs. Through 17 weeks of the 2018 regular season, Prescott managed to complete 82-of-156 attempts for 1022 yards, nine touchdowns, and just two interceptions, and while the box score numbers paint him in a positive light, upon closer inspection we can see that 17.8% of his total attempts were negatively graded, which is the sixth-worst rate among quarterbacks in the league. However, while his play-by-play grading under pressure is underwhelming, it’s nothing compared to the sheer amount of sacks that he’s taking. This year, Prescott was sacked 56 times after the defense managed to register pressure, and only Houston’s Deshaun Watson was sacked more (61). 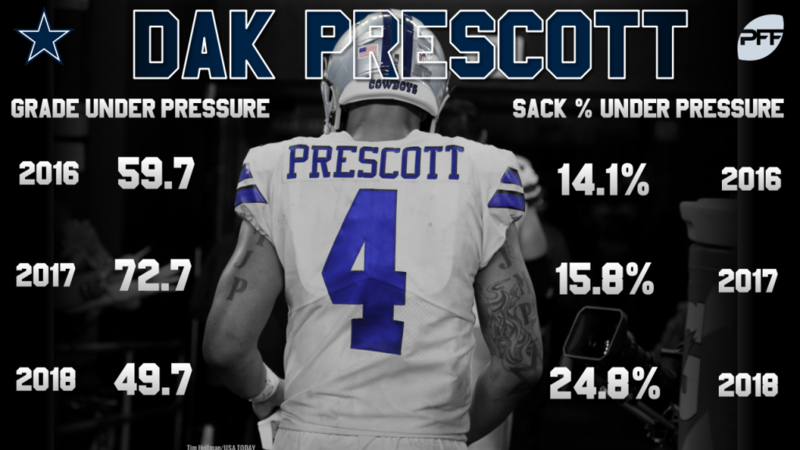 All told, Prescott took a sack on a whopping 24.8% of his pressured dropbacks, which is the league’s sixth-highest rate and almost double the rate of that oh so impressive rookie year. Making matters worse, 44 of those sacks came from a regular rush, as opposed to the defense sending an extra man, and 15 of those sacks were the result of Prescott holding onto the ball too long – both of which lead the league’s quarterbacks. If the Cowboys are going to reach the Conference Championship for the first time since 1995, Prescott and the Cowboys will have to overcome one significant obstacle; the Los Angles Rams‘ star interior defender, Aaron Donald. Donald ended the regular season with his fourth straight pass-rushing grade of at least 93.0 and a colossal 106 players next to his name. As Senior Analyst Mike Renner wrote, 53 pressures make you an elite defensive tackle in the NFL. Only six interior defenders had more this year. 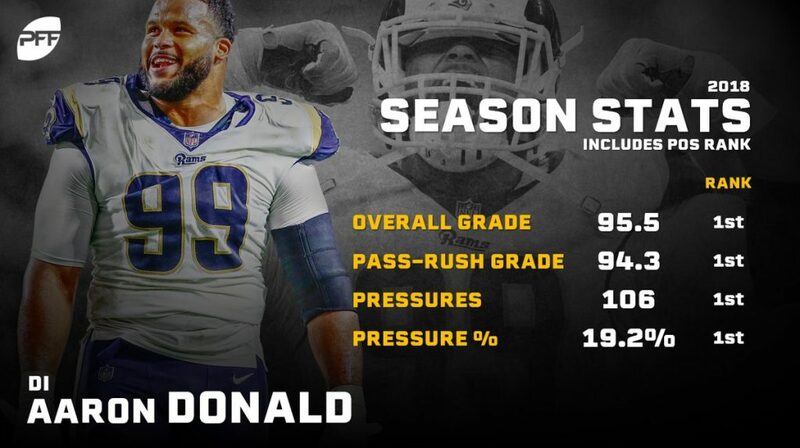 Donald doubled that output this year on his way to the league’s best pass-rush win rate (25.9%) and the league’s best pass-rushing productivity (23.0). As the Cowboys prepare to take on the Rams in the Divisional Round, they simply need their quarterback to make good decisions and get the ball out quickly before he faces the pressure that will inevitably be coming. If he continues to hold onto the ball and take the hits under duress, things will quickly get away from America’s team in their second playoff game of the year.